Expanding hygiene and workwear specialist, Needlers Limited, has relocated from Hull to the Melton West Business Park just a few miles west of the city. The company, which grew by 40 per cent last year alone, has taken a 53,000 sq. 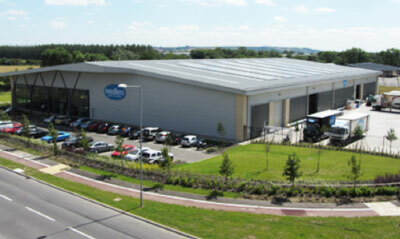 ft. high bay head quarters and warehouseing unit on the increasingly popular business park. When constructed last year, the building was the only speculatively built commercial premises available at the time in the Yorkshire and Humber region. Needlers managing director, Alistair Needler, said: “We had outgrown our former premises in Harpings Road, Hull, and this new development by The Wykeland Group simply ticked all the boxes. “The space is just what we need and the location of the business park, just a couple of minutes off the A63 dual carriageway, give us easy, uninterrupted access to the motorway network. We have goods vehicles arriving and departing from our premises throughout the day to deliver to clients around the country and this move will really add to our business efficiency”. He added: “We employ 55 people and most of them live either in Hull itself or just to the west of the city so moving out to Melton West has also been good for them, since the journey to work is quite easy thanks to less traffic”. The Needler site measures 2.8 acres. Within the 53,000 sq. ft. building is 6,000 sq. ft. of office space while outside there is an excellent goods in and goods out yard and ample car parking. Wykeland managing director, Dominic Gibbons, said he was delighted to have such a well known brand as Needlers on the Melton West Business Park. He added: “We developed the building speculatively but we were confident of finding an occupier without any delay. “The nature of Alistair’s business means his vehicles must have easy access to the UK motorway network”. Needlers Ltd joins a growing band of high profile companies at Melton West, including Allam Marine, Heron Foods, shower manufacturer Kohler Mira and House of Townend. Planning permission for Phase 2 was granted some months ago, paving the way for the development of a further 46 acres and 620,000 sq. ft. of manufacturing, warehousing and office space that could create up to 1,400 new jobs.